This is a nice clean and rare hog ringer pliers, that is not marked by the maker's name. This is a double ring groove type pliers. These pliers are 6.5" long with two different size nose ring slots in each jaw. This allows the user to hold the ring and close the ring into the nose of the animal with ease, basically they are for two slightly different size rings. 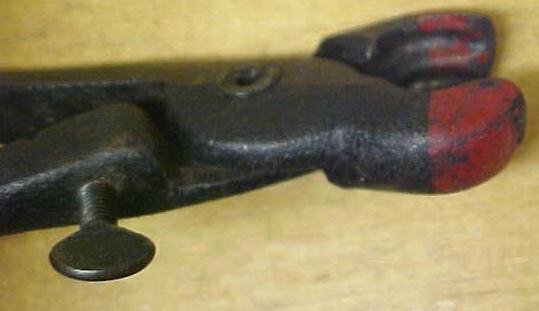 The pliers are in very good shape overall, with about 95% of the original paint intact, red at the tip, the rest black. The pivot pin is in good working order, with a little wear, snug, no rust or damage, in very good usable condition. The depth set screw is in good condition, and the handles have a nice cross hatch grip design on them. A unique design, and a nice collectible farm tool overall! Very rare! Items Similar To "Antique Hog Ring Pliers Pliers Double Ringer 6.5 inch"